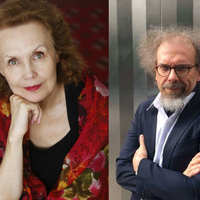 Mannes composers-in-residence Kaija Saariaho and Jean-Baptiste Barrière will collaborate with flutist Margaret Lancaster in a multi-media event for flute and live electronics, with stage direction by Luca Veggetti. Across a crowded contemporary musical landscape, Finnish composer Kaija Saariaho stands apart with her sensual, expansive soundscapes. A composer of immense imagination, her spellbinding scores evoke luminous color and emotional depth while being full of new instrumental techniques that often blend acoustic instruments with subliminal electronic manipulation. Kaija Saariaho was born in Helsinki in 1952, she studied at the Sibelius Academy there with the pioneering modernist Paavo Heininen and, with Magnus Lindberg and others, she founded the progressive "Ears Open" group. She continued her studies in Freiburg with Brian Ferneyhough and Klaus Huber, at the Darmstadt summer courses, and, from 1982, at the IRCAM research institute in Paris, the city which has been most of the time her home ever since. “New-music luminary” (The New York Times), Margaret Lancaster has built a large repertoire of new works that employ extended techniques and mixed media, fusing music, theater and movement. Performance highlights include Lincoln Center Festival, Spoleto Festival USA, Santa Fe New Music, and the 7-year global run of OBIE-winning Mabou Mines Dollhouse. She has recorded on New World Records, OO Discs, Innova, Naxos, Tzadik and Mode, and was selected for Meet the Composer’s New Works for Soloist Champions project. Noted for her interdisciplinary performances, Lancaster, who also works as an actor and dancer, presents solo and chamber music concerts worldwide, and with Either/Or tours Morton Feldman’s 5 hour epic For Philip Guston. Jean-Baptiste Barrière is a composer and multi-media artist born in Paris, France in 1958. He studied music, history of art, philosophy and mathematical logic at Université de Paris I - Panthéon-Sorbonne. Parallel to composing, he made a career at Ircam/Centre Georges Pompidou in Paris, from 1981 to 1998, where he was successively researcher, then Director of Musical Research, of Education, and finally of Production. In 1998, he left Ircam to concentrate on his personal projects about the interactions between music and image. In 1997-98, he taught Computer Music Composition at the Sibelius Academy in Helsinki. In 2011-12, he was Visiting Composer at Columbia University. His compositions, videos for concerts and operas, as well as interactive installations have been presented all around the world. Born in Bologna in 1963 and trained at La Scala Milan, Luca Veggetti began in 1990 a career as choreographer and stage director. Turning his interests toward contemporary music, experimental forms and new technologies, he has developed collaborations with some of today’s most important musical ensembles, and with composers such as Kaija Saariaho, Jean Baptiste Barriere and Toshio Hosokawa. His work has been produced and presented by some of the world’s leading theaters, companies and festivals, and institutions such as the Drawing Center, Works&Process at the Guggenheim and the Metropolitan Museum of Art in New York. Morgan Hurst received her BFA in Dance from S.U.N.Y. Purchase in 2014, and graduated with the Bert Terborough Award. She is currently freelance dancing for Luca Vaggetti and MMDC. She has done work for Nimbus Dance Works, Sum Bones, and for various other freelance artists. She has also done projects with Doug Varone, Joanna Kotze, Kyle Abraham, Sidra Bell, John Higginbotham, Laura Aris, and has done a number of works for the Cunningham Trust. Sponsored by the Mannes School of Music. Co-sponsored by the Washington Square Contemporary Music Society. This event is part of the Nth Degree Series: Creative Minds Creating Change. For more information, visit the series website.